Nihilumbra did not get enough the first time it entered Family Friendly Gaming Universe. It came back for a second helping. Nihilumbra said: "yes sir give me another." In case you are not aware of what I am referencing - Nihilumbra was reviewed by Family Friendly Gaming on the Playstation Vita. It has now been released on the Wii U. There is now a two player cooperative mode - which is pretty cool. I wish more video game companies did what BeautiFun Games is doing. They are releasing their game on different systems. It makes sense too. Release it on one system, and as revenue pours in, port it over to another system. Repeat the process as long as there are viable systems to release your game one. 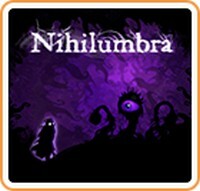 Nihilumbra works great on iOS, Android, Windows phone, Linux, MAC, PS Vita, and now Wii U. There are multiple dark colors used in Nihilumbra. Players earn a new color with a new power in each of the worlds. Players are constantly running from the Void, which wants to have us back. I felt like an escaped convict or something while playing Nihilumbra. The music is a bit on the creepy side if you ask me. I know others at Family Friendly Gaming like the music. The two player cooperative mode is awesome as long as ya'll communicate. We learned to be specific - like blue on that platform, and green down there. Or get that enemy with some red. What is really cool is when two family members are completely in sync. The one adding the colors knows what the one moving the character needs and when. That kind of harmony is awesome. Nihilumbra is a bit on the short side. Especially for that $7.99 price tag. Nihilumbra is also a downloadable only video game. We are required to kill of a variety of gross, and mildly disturbing creatures in Nihilumbra on the Wii U. Some of those monsters could scare little children. I don't get what is going on in the story in Nihilumbra. It was way above my head and way above my pay grade.